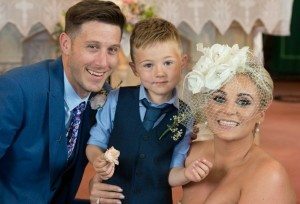 In the very first of my real wedding features, this month I talk to Lisa (an administrative assistant from Dublin) about all things wedding – the proposal, the dress, the planning, their best bits…and the suppliers they used, loved and would recommend! Lisa and Gerard, both from Dublin. Can you give me a brief background on who you both are and where you’re from? Lisa (32), an administrative assistant from Glasnevin and Gerard (35) a plumber from Dublin City Centre. We’ve been together 15 years and have one son Zack (6). We met in Dublin nightclub The BackGate in 2001. I knew all of Gerard’s friends but had never met him before. It was Gerard’s neighbour who introduced us. I had told her I fancied this lad but didn’t know his name and suddenly she walks up to me with Gerard in tow! We spoke very briefly that night but never swapped numbers, so I took matters into my own hands & decided to text one of Gerard’s friends looking for his number. I rang him and we ended up going to the cinema that night – we hit it off and I’ve never let him live it down since that I was the one who rang him! 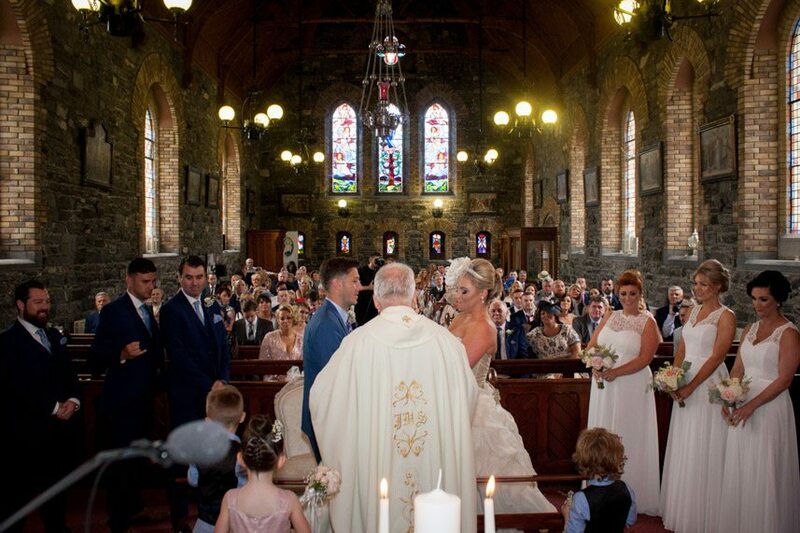 Exchanging vows in Culmullen church. Gerard proposed on Christmas morning 2013. It was a massive surprise to me as we had been together 12 years at that stage. We had gotten up to see what Santa had left for our little boy Zack, and after Zack had opened his presents Gerard told me to wait at the hall door. Himself and Zack went out in their slippers and dressing gowns to the van on that snowy morning. I didn’t have any idea what he was getting, thinking that maybe it was flowers that he left in the van overnight so I wouldn’t see them. Suddenly I see Gerard walking from behind the van. Zack was in his arms holding a big sign with the words ‘Will You Marry’ written in red paint! I couldn’t believe it. We were living in my mam and dad’s house at the time so mam was squealing with excitement all the while recording the proposal. Both mam and dad were in on it as Gerard has asked for my hand in marriage a few weeks before. They just didn’t know how he was going to do it that morning. Needless to say that Christmas was one we won’t forget. We spent the day and night celebrating with family. We got married in St. Martin’s Church Culmullen on Saturday July 30th 2016 and held our reception in the Knightsbrook Hotel , Trim, Co Meath. Tell us a little bit about your dress and bridesmaid dresses? 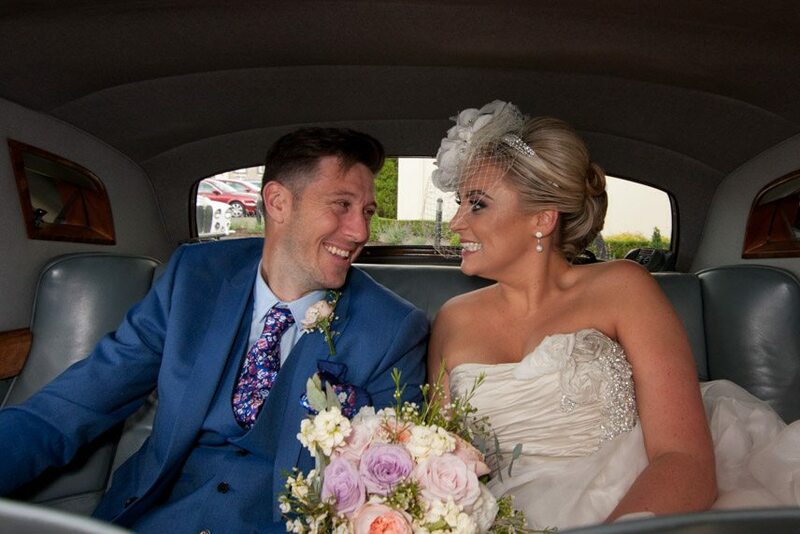 I wore the Amalfi dress by Ian Stuart which I purchased in Ti Adora Bridal in Kilkenny. The dress had a full skirt with train and an ivory champagne bodice with diamante and flower detail throughout. I had been to Ti Adora Bridal before with my sister when she bought her wedding dress there in 2012. Noeleen who owns the store is the only stockist of Ian Stuart gowns in Ireland, so I knew I needed to make the trip. Lisa and her three bridesmaids. I had actually won a competition on Ti Adora Bridal’s Facebook page to win a dress for half price in October 2014. At that stage, I felt it was too early to try dresses on but decided to make the trip anyway since I’d won the competition. I went with my mam, sister and godmother one Sunday evening. I tried on the competition prize dresses but didn’t feel any suited me. Since we had made the trip from Dublin I decided to try on dresses that weren’t part of the prize. I was trying on the last dress of the day and had decided that maybe none of these were for me, until I stepped out in the Amalfi. I adored absolutely everything about it and knew by the expressions on the faces on my entourage that they loved it as much as I did. I didn’t want to take it off and that’s when I knew I had THE dress. 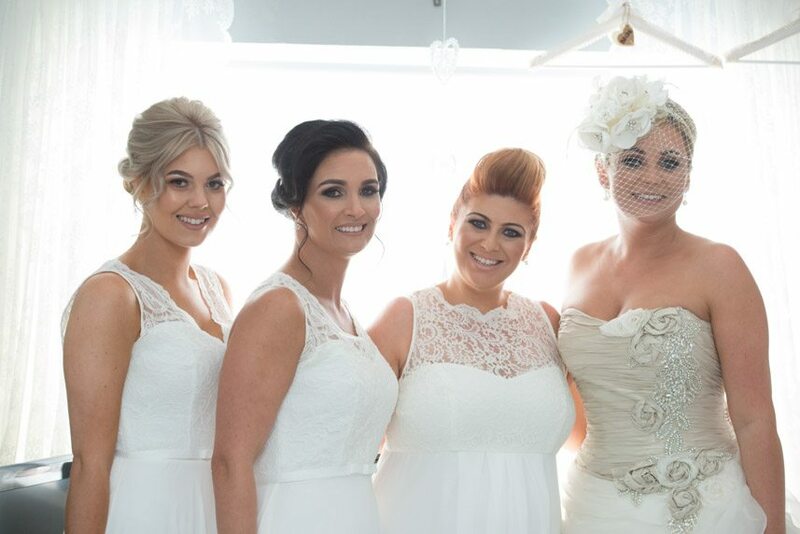 My three bridesmaids wore an ivory ‘Dessy’ dress which I purchased in Bridal by Nikki Kavanagh in Ratoath. They complimented my dress perfectly. My flowergirl wore a dusky pink John Rocha dress from Debenhams. I know this is probably a cop out but I cannot pick one part of the day. We had a ball all day; from getting ready at home to the church to our reception. I don’t think either one of us has laughed so much before. The priest and all our guests said we were the most relaxed people on the day and we couldn’t help but enjoy every second of it. Would you do anything differently if planning it again? Sit down and do a budget. Myself and Gerard didn’t do one and just booked the services that we loved. Luckily it worked out well but it could have gone horribly wrong for us! 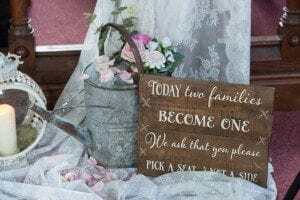 Any tips or advice for couples planning their wedding at the moment? If you see a supplier that you like, regardless of how far off your wedding is make sure to book them, especially your band! We knew we wanted The Bentley Boys as we had heard them before so they were the first thing we booked two years in advance! Everything else followed after that. 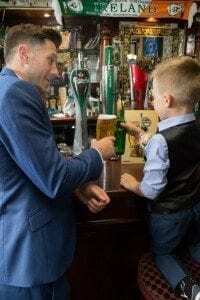 Zack helping Daddy settle the nerves! Real wedding feature: copyright weddingsbyantoinette.ie 2016. Image credits Couple Photography (not to be re-used without prior permission).